What Do You Need to Know About HELOC? If you’re a homeowner, there’s a good chance that your most valuable asset is the house where you live. This means that if you ever need to borrow money, your home can be leveraged as useful collateral to help you get the best rates. This is known as home equity, and it comes in two forms – a home equity loan, and a home equity line of credit. 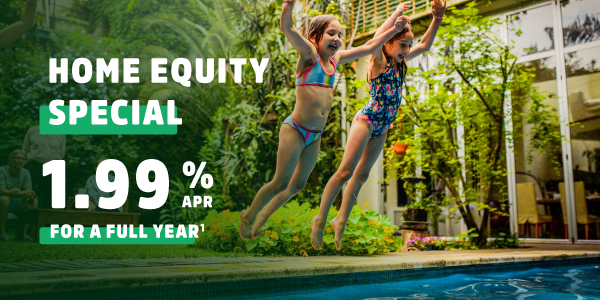 While a home equity loan provides you with a one-time lump sum, a home equity line of credit – also known as a HELOC – gives you the flexibility to draw funds whenever you need them. You can typically access around 80 percent of the total value of your home, minus whatever balance remains on your mortgage. Your credit score and other factors such as employment may also affect how much money you can access via a home equity line of credit. You can think of a HELOC as a bit like having another credit card. When you start your line of credit, a time limit and a borrowing limit will be set; for example, you might be eligible to borrow up to $100,000 over a time period of 10 years. You can withdraw funds on an ad-hoc basis, and some financial institutions like the HUECU even let you use online or mobile banking to quickly and easily access your home equity credit. After the set time limit, your repayment period will begin and you can start paying back any money that you’ve borrow via your HELOC. Who Should Borrow With a HELOC? If you’re looking to remodel your kitchen, upgrade your bathroom or just make a few key repairs around your home, then taking out a home equity line of credit is a fantastic option. In fact, the HELOC was initially designed as a way for home owners to leverage the current value of their house while conducting upgrades to improve its value in the future. A HELOC can be especially useful if your home is in need of urgent repairs that, once complete, could save you money by preventing an accident or further damage in the long-run. A major benefit of borrowing with a home equity line of credit is that you can take advantage of interest rates which are lower than what you’d get with a credit card or a personal loan – which means less money to pay back in the future. In addition, interest that you accrue with a HELOC might be tax deductible, if you use the funds to make substantial improvements to your home; this according to the IRS. Tapping into your home equity as a line of credit is also a good way to protect your financial stability and ensure that if an unexpected emergency occurs in the future or you lose your job, there will be a line of credit ready for you to draw upon. Do I Need a Line of Credit, or a Loan? A fixed home equity loan is a great solution for a one time project or big purchase, because the money you borrow is distributed just one time, in a lump sum. A home equity line of credit, on the other hand, lets you tap into funds on an ad-hoc basis. If you don’t need lots of money at once, a HELOC may be the right choice as it prevents you from paying interest on borrowed funds that you’re not yet putting to use. How to Choose the Right HELOC? Many financial institutions have options to help you tap into your home equity, but the right home equity line of credit should as a minimum offer the ability to borrow up to 80 percent of the equity of your home, no pre-payment penalties, and an interest rate that’s lower than what you’d pay when borrowing with a credit card or personal loan. You can also find additional benefits such as no closing costs, a below-prime interest rate good for the full borrowing period and no annual fees, all of which are offered when you take out a home equity line of credit with HUECU. Limited time special! We’ve lowered our Home Equity Line of Credit rate for a limited period of time. Right now we are offering an exceptionally low intro 2.99% APR for the first 18 months if you apply by April 1. To learn more about home equity lines of credit or other products that can help you borrow funds in a financially viable way, why not schedule an appointment with a member of the HUECU Mortgage Team? They can help answer any other questions you have about whether or not a home equity line of credit is right for you.